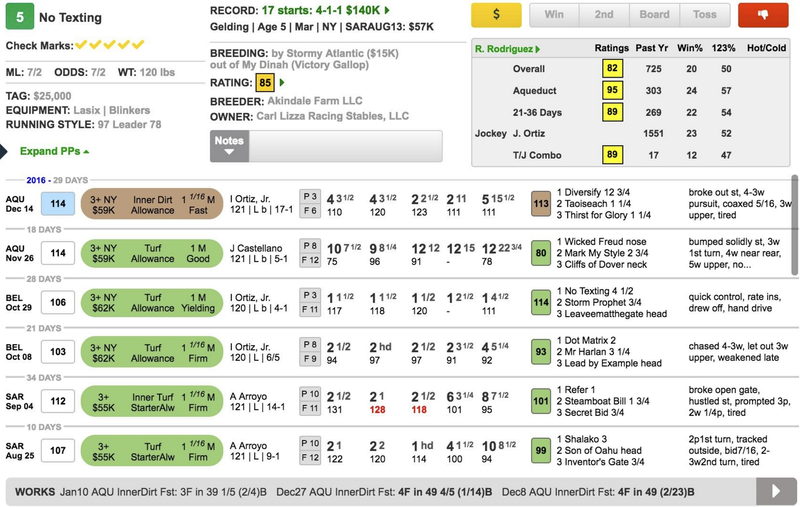 With the scratch of morning line favorite All About Ashley, this race becomes more wide-open from a wagering perspective. I was going to use All About Ashley defensively, but I wasn’t necessarily sold on his chances to beat a field of this quality, and his absence doesn’t change my view of this race. The runner that I want the most is NO TEXTING (#5). No Texting ran much better than it would appear at first glance in his last race. While he lost by more than 15 lengths, that field was dominated by runaway winner Diversify, who is on track to be the next New York-bred superstar. No Texting is typically a horse that needs to be forwardly placed in order to be effective, but he actually rated kindly and made a wide bid that carried him into second place on the far turn. He faded in the final eighth of a mile, but his effort was still good enough to earn him a 113 TimeformUS Speed Figure, the highest last-out number in the field. I expect him to be more aggressively ridden in the early stages as he gets a rider switch to Jose Ortiz. I’ll use him with the three other logical contenders. Glowing Ember (#1) also has speed, but two turns on the dirt may be too great of a test of his stamina. I would expect No Texting to sit just off him early and put him away at the top of the stretch. I would also throw in closers Onecats Chance (#3) and Hurry Up Alan (#8). The former has spent too much time sprinting in recent starts, and the latter was just overmatched last time but had previously been effective over this inner-track surface.